When we question the ways in which period woodworkers were able to work so efficiently with hand tools, there are some obvious answers. One of the most obvious, of course, is experience. Apprentices typically spent a minimum of 7 years working 6 days per week, for 12 hours per day, just to earn the title of journeyman. Once their apprenticeship was complete, the new journeyman could be hired by the shop in which he apprenticed, find employment in another shop, or even start their own shop. In either case, they would have had a lot of hands on time to hone their skills. Another way they may have learned to work faster would have been to specialize. Just like today, many jobs requiring a unique skill set were quite often sub-contracted out. Things like carvings and turnings could, and often times would be sent to tradesmen who specialized in these skills and could produce the pieces much faster and at a much higher quality than if everything was done in house. Still, there are plenty of shops, such as those of the Townsends and Goddards, who chose to keep all of the work in house. Turning was a task that may have been sub-contracted out to a craftsman who specialized in the skill. Studying old furniture in museums and antique stores will reveal another obvious way that period craftsmen saved time. The outer, show surfaces of these pieces are usually very finely finished. However, if you look at the insides of cases, the bottoms of table tops, case backs, drawer bottoms, and many other areas that are not seen in the final piece, you might notice that these surfaces were left very rough. It is not uncommon to find saw marks left from the pit saw or water powered mill. Fore plane marks are also very frequently still visible on non-show surfaces. I’ve even seen pieces where some of the bark was still present. Some efficiencies are not so obvious, and are only revealed by careful inspection of antique pieces or some experimentation in our own shops. One example for me personally was the use of in-cannel gouges. Antique pieces often show tool marks in areas like the bottoms of scrolled table aprons, for example, that obviously weren’t made by a rasp or file. While they did have rasps and files during the period, I don’t think they relied on them as much as we do today, because they are not very efficient. Any way you slice it, rasps and files, are relatively slow tools. You can get fairly aggressive rasps, but they leave a very rough surface. So the surface needs to be refined with finer and finer tools, which is slow. Edge tools on the other hand are very fast and can leave a very clean surface behind. The problem arises with concave curves. 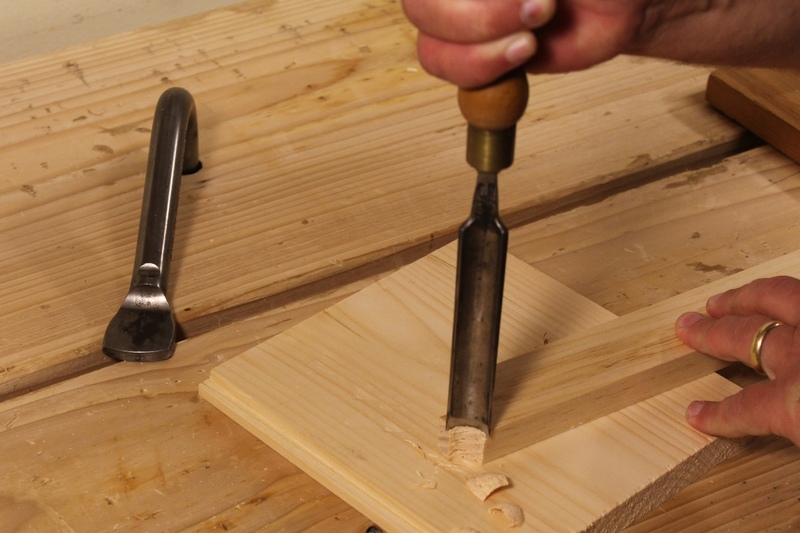 Chisels can’t get into the concavity, and out-cannel carving gouges have to be used at an awkward angle in order to pare vertically with them. In-cannel gouges, however, can make vertical paring cuts and leave a clean, perfectly shaped concave curved surface in just a few seconds. In fact, in Peter Nicholson’s book The Mechanic’s Companion, the only gouges he talks about in the joinery section have their bevels ground in-cannel. There is no mention of out-cannel gouges at all. By using a sharp in-cannel gouge, concave curves can be pared fair, smooth and ready for finish in a matter of seconds. Experimenting in this way is a great way to build your hand skills while you try to understand some of this history. While woodworking isn’t a race, it’s fun sometimes to see how traditional tools and techniques can be used to get a job done quickly. Often, just looking through an old book, or studying the tool marks left on an antique piece of furniture will provide clues to more efficient methods of working, such as those just described. 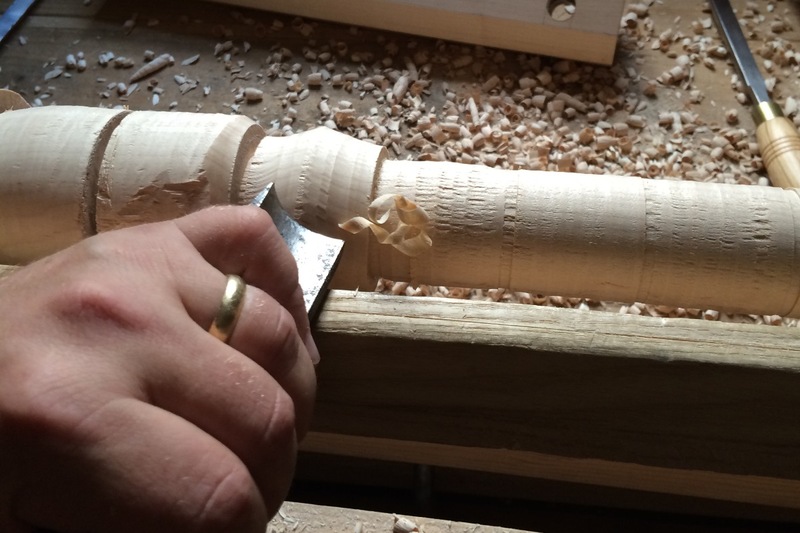 However, in order to discover some of the other secrets to working efficiently with hand tools, we need to be a bit more observant, and maybe even experiment a bit more. Posted in Random Thoughts and tagged efficiency with hand tools, in-cannel gouges.